"Salty" a Harkers Island Net Boat. 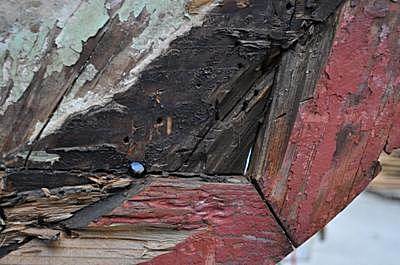 The continuing story of my Harkers Island Net Boat restoration. 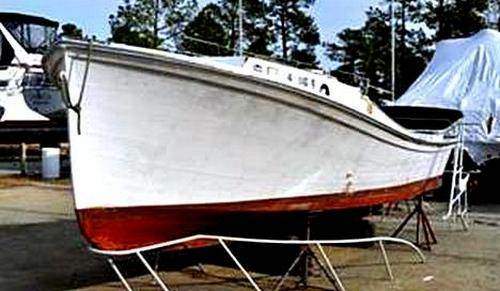 She is a 1960 Vintage Wooden Harkers Island Net Boat 26' LOA and 9' Beam. Well it's been awhile since I added to my blog, but life is a winding and twisting road and sometimes there are more important things than boats. I have been moving forward on getting the floor frames in place and it hasn't been easy. I have definitely struggled with fitting up the joints and there are a few Dutchmen lurking in there. 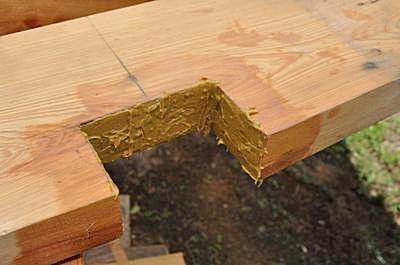 I think it may be easier to build fresh than working in new wood for replacement. 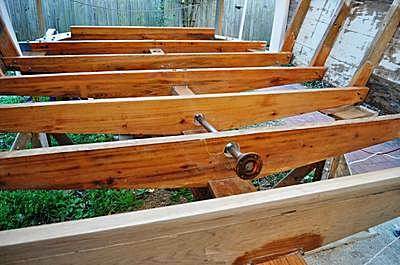 I have the ring timber bolted up and several of the floor timbers. The lower tips of the sided frames are rotten and I’ve been slicing in new wood. I really didn’t want to pull all the fasteners to fix them. I’ll sister another thin frame to the originals. 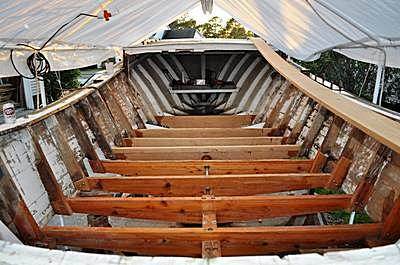 I am going to plank it traditionally and caulk the seams with cotton and then seal with a seal compound. 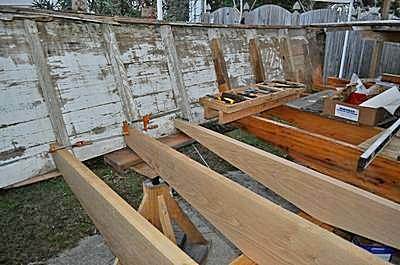 Hope to pick up the plank in the next week or so and planning on cedar. 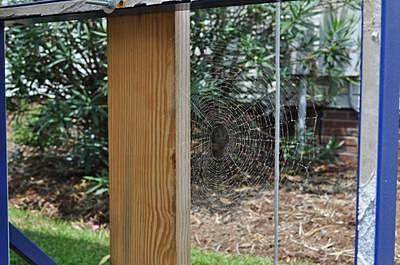 The weather been pretty hot and muggy here in the Carolinas, but the work is still a pleasure. 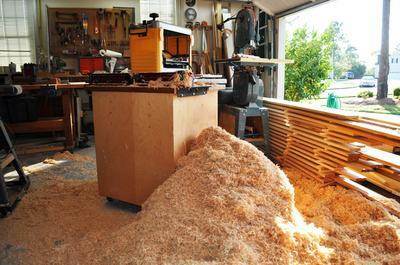 I had at least three piles of shavings this size before the cedar was planed out. My activity on the boat has been sporadic at best but always chipping away at it. I have been planing a lot of cedar and I got an engine so those are big steps. 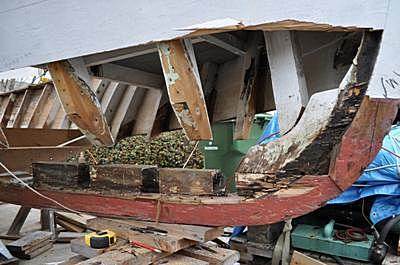 Waiting for the bedding compound to get delivered and I'll start planking the stern so I can take the support out and that will make it a little bit easier to get around. We will also be stripping the engine down for clean-up and a solid paint job. 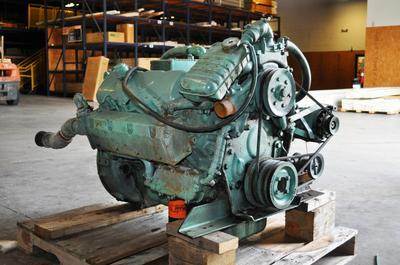 It's a Detroit Diesel and a bit long in the tooth, but it was an RTO from another Harkers Island Net Boat boat similar to mine. Here's a view of the transmission end. It's a 1:1 but don't brand. As I have been moving forward with the rebuild the frames, both floor and side are looking better and I think they will be staying. 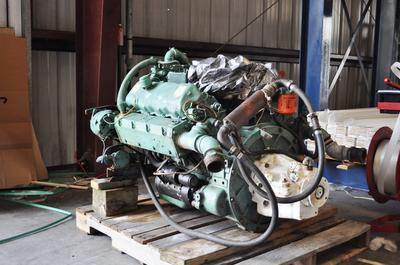 Just might sister a couple to support the heavier engine. Spent a week recently in New Hampshire and ran into a Hobby Steam Launch event. Very interesting seeing the steamers and the range of hulls and engines. Very quiet boats and some were very nicely built and as big as the African Queen. 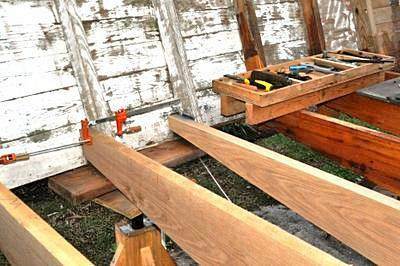 Picked up some 8/4 white oak to make frames for the engine support. The diesel is quite a bit heavier than the 318 Chrysler and I think it should be a little beefier under it. The Detroit at 1500 lbs. probably out weighs the 318 by 1000 lbs. I am banking on it not being too heavy since it came out of another wooden Harkers Island Net Boat also at 26 ft. It was an RTO and the other boat is powering up to get out and back as fast as they can. Using the old frames for patterns made the job a lot easier. They almost drop right in place except for having to notch them out to accept the keelson I've added. 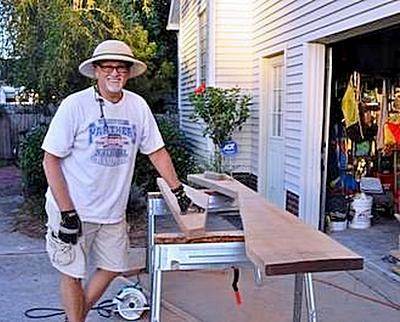 When cutting 8/4 white oak it is always good to start with a fresh blade. There is no sense smoking things up and struggling with the cuts. One blank was actually too narrow to get the whole frame on so I fastened a 1-1/2 wide board to the frame and spaced it that much higher on the blank. This offset allowed me to get the angled sections on the blank and now I just need to piece a 1-1/2” strip on the top of the new frame. 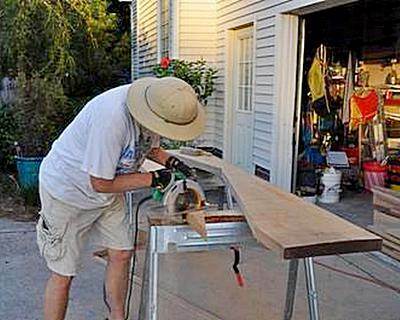 Wood is just too expensive to always go full size. Piecing it up in select areas is alright as far as I’m concerned. 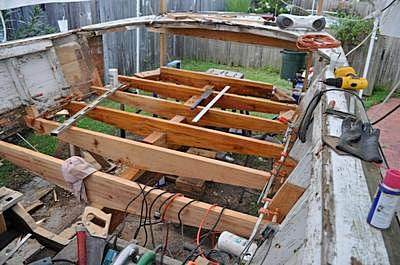 I am happy with the progress of late and should be working under the cutty in a couple of weeks. Then start planking in earnest. It has been a while since my last entry, but there is some progress to show. Working on Salty and the rest of life doesn’t leave much time for blogging. 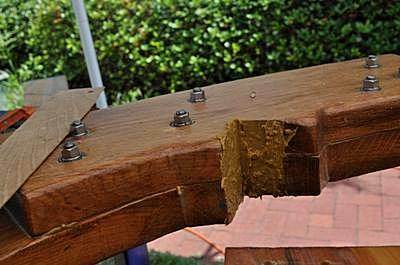 I have gotten almost all of the frames replaced save those that are carrying the strip planking which forms the curved surfaces to the bow. Remaining are the last four frames or the first four depending on how you look at it. 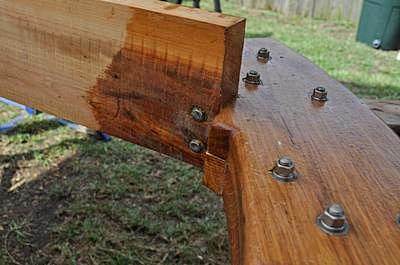 I was hoping to save the strip planking and pulling the frames will force the removal of fasteners that would probably destroy the strips. 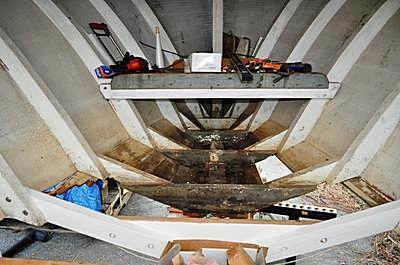 I have started strip planking the stern and that should go well although a bit slow since there are many narrow planks. 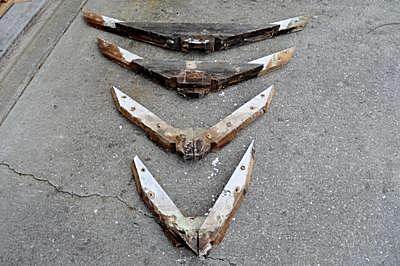 They all require a taper and edge bevel for caulking. 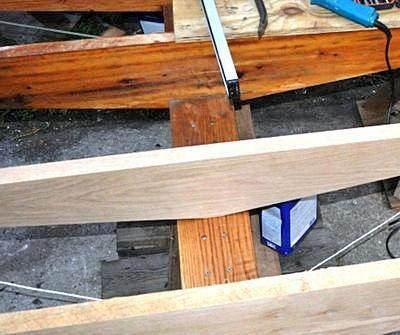 The original planking was edge nailed without any caulking. 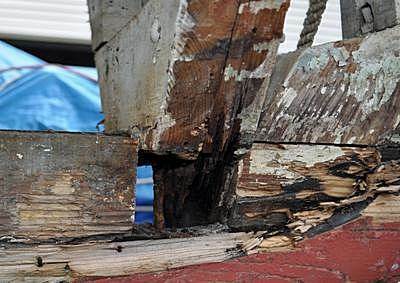 It must have shipped some water since the planks are mostly above the waterline and would dry if not kept wet by usage. 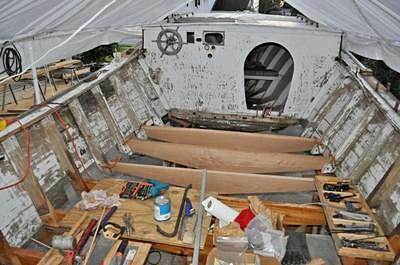 The pictures show the progress and after the fairing of the floor frames fore and aft and to the keel the planking will begin. I should be well into it about mid-February. We are looking to get her into the water this summer. 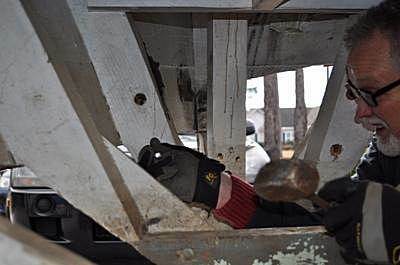 March 2013 update for my Harkers Island Net Boat. Well, it's been tough to get time on the rebuild but I am coming to a milestone. I have pulled the last four frames for replacement. All along I had been hoping that I could use them as is (actually the last 7 frames) but as I got farther into them it was clear they had to go. These last four were relatively easy to get out and I will have good wood to trace. The fairing of the frames will also go well since the side frames are still in place and they hold the shape. 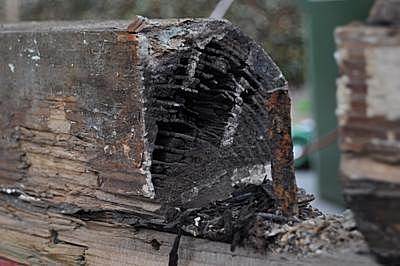 The photos show how deteriorated they are and the fasteners parted with very little resistance. 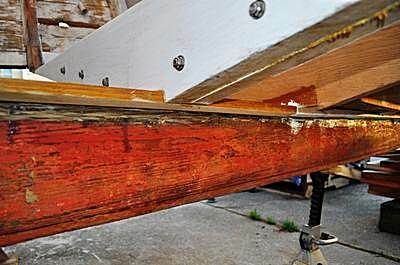 The keel is pretty rotten at spots and I'll fill those with epoxy. 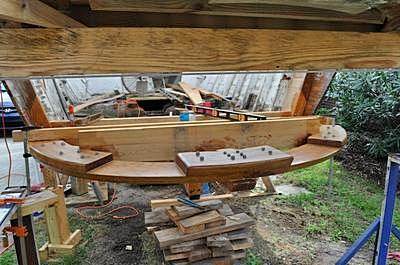 After replacement the bottom frames will be ready to fair and be planked. If you back through my blog you'll find quite a few references to "ready to plank". It's like a false peak when you're hiking. Thanks for taking a look at my Harkers Island Net Boat, suggestions and encouragement is always accepted.